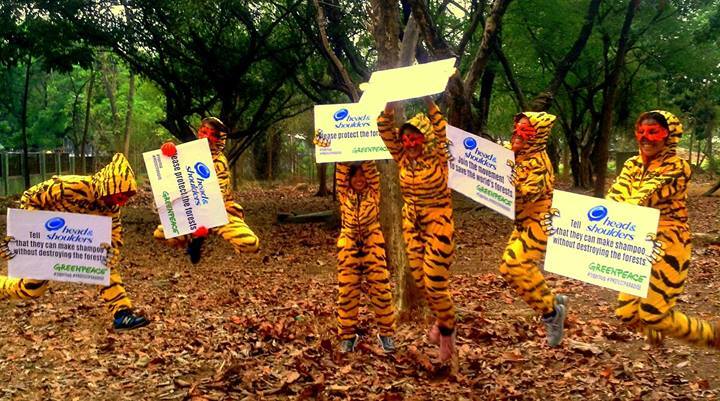 On the 9th of March, along with five other Greenpeace volunteers, I donned a tiger costume, faked fierceness and roared to campaign against the deforestation in Indonesia. To clarify, I was not in Indonesia, I was at the Ninoy Aquino Parks and Wildlife. It was my first foray in environmental campaigns. It was a beautiful Sunday morning, the sun not too hot and a mild breeze was comforting for the crowd at Wilflife, mostly families, hobbyists and the GP (Greenpeace) activists. It was an almost perfect day for a save-the-trees campaign. Almost. If we’re friends on Facebook and/or Twitter or in real life, you may have remembered me posting about GP’s campaign to stop the massive deforestation in Indonesia. You see, big corporations have this not-so-great, in fact, a fraction below evil and totally irresponsible idea of clearing the forests and replacing them with palm tree plantations. Why? Because palm oil is like gold in manufacturing. A lot of the products we use in our daily life uses palm oil: soap, toothpaste, shampoo, chocolates, cooking oil, you get the picture. To be fair, and this may restore your faith in humanity, some manufacturers have already committed to join the campaign and not to get their palm oil from the Indonesian forest turned palm tree plantations. But as it is, there are still major corporations who have not joined the call. I’m looking at you Procter & Gamble. Hello, there, Head & Shoulders. So Greenpeace is urging the public not to boycott P&G products but rather, ask P&G to use palm oil from sustainable sources. See, profit or progress is never an excuse for destroying the forests. By the way, the forest in Indonesia is considered the lungs of Southeast Asia. You don’t want your lungs destroyed, right? * Don’t attend a GP event (or any outdoor activity for that matter) with alcohol still in your bloodstream or hungover as alcohol has been infamously linked to impairment of judgement. So expect a lot of second guessing your actions and trouble remembering instructions. Also, decision making skills may be a bit slow, at times, almost nonexistent and definitely not so impressive. * Being lethargic does not really go well with a tiger costume at the park. Faking alertness and an upbeat mood is inversely proportional to the amount of alcohol you have just consumed a couple of hours prior. * Keep in mind the importance of staying vertical when you’re nauseous. At one point, they asked us to be on all fours because, you know, tigers, and I almost hurled. I tried my best to stay standing from that point onwards. There is no way you can be fierce while vomiting. 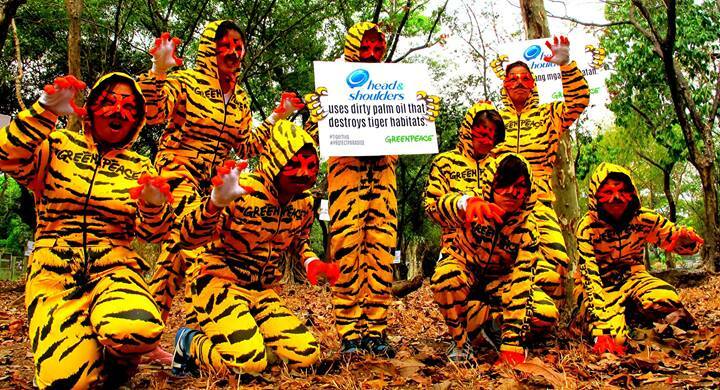 * If you hold a sign saying Free #TigerHug, random strangers will approach you for a hug. Maximize the awkwardness by educating them on the campaign. Hey, they owe you for the hug. * You get instant good vibes when you hug a tree. Enough said. * Trees do have a way of reminding you of beauty and selflessness and first love and poetry and rusty childhood memories. No, seriously, they give us oxygen and then we cut them. Harsh much? * Doing something for the environment gives you a high. Alcohol can do that, too, but the former does not make you puke.